The idea that training can solve all productivity problems can lead an organization to failure. Many organizations share a common assumption that if an employee isn’t doing something “right,” then he or she needs more training. This assumption, and others that immediately look to training as the go-to solution, may sound like job security to a learning professional or an easy solution to upper leadership. However, the idea that training can solve any and all behavioral or productivity problems can lead an organization to failure, which may result in a loss of support for training programs altogether. Traditional training models can solve one basic problem: lack of knowledge or skills. A performance issue resulting from a lack of knowledge or skills is easy to fix: Provide effective training and an ongoing learning and support system, and the problem is solved. If it’s not a training issue, then training won’t solve the performance problem, no matter how stellar the training solution is. This type of failure will convince upper leadership that training is ineffective. To ensure the longevity and success of your training program, it’s crucial to offer solutions that work rather than the same repetitive go-to training. What about all of the other causes of performance issues? If training only addresses one cause, does that mean your training program is unnecessary? Absolutely not! Every quality training program can support overall performance improvement solutions. Employee productivity, job satisfaction and overall performance will improve drastically with one simple change: Eliminate blanket training solutions, and start matching the right solution to each individual issue. Being fully prepared with an updated and organized performance needs analysis, or gap analysis, will be your best tool. Whether you are a training professional who works with different businesses or a corporate trainer for one business, take some time to develop your own needs analysis form and process. It’s important to tailor the needs analysis to the business you are serving and to your development style. Create a tool that feels natural and that you can use quickly and easily. Whenever you are talking with management and upper leadership about possible training issues or assignments, take the opportunity to educate them on the difference between training issues and performance issues, and offer to develop the best and most effective solution. Your needs analysis should include methods to help identify if any of the following performance issues exist. Sometimes the best needs analysis is done by shadowing employees for first-hand accounts of their experiences, asking questions and actively listening to them. The real cause typically reveals itself quickly when you go straight to the source. Because people are complex and deal with vast amounts of competing demands, the number of issues, contributing factors and causes of performance issues can be endless (which makes the needs analysis so important and the results sometimes unpredictable). Here are some common issues matched with solutions. Issue: They know how to do the task but don’t realize that they’re doing it incorrectly. Feedback is one of the most powerful learning tools. Most adults are capable of closing their own performance gaps once they know they exist. Provide regular and consistent feedback to communicate clear expectations and areas for improvement. You can give the feedback, or you can provide training and tools to the individuals responsible for giving feedback on the best ways to do so. Issue: They forget some of the steps in the process. People cannot be expected to memorize long or difficult processes. If there are detailed steps that need to be completed, it is vital to provide a job aid to assist the learner. The aid can come in the form of an electronic knowledge base or a paper handout, but there must be a resource to which employees can refer for help completing each step. Issue: They know how to do it but repeatedly forget when to do it. If the flow of individual tasks is not intuitive, it’s important to provide a solution to help the employees remember it. You could provide a visual job aid or, even better, improve the system by providing an automated reminder. Issue: The process is too difficult or cumbersome. Expectations must be realistic. If the reason an employee is not performing is because the task is too difficult or cumbersome, take the time to fully understand the process and then simplify it. Even if you are only able to simplify one step, employees will appreciate that you took the time to understand what they were doing and that you made the effort to improve it. Promise to continue this effort, and you will contribute to a culture of positive change in which employees are more engaged, loyal and motivated. Issue: They don’t understand why they have to do it. Adult learners need to understand why they are expected to do something and what will happen if they don’t. This simple solution typically ends in a comment like, “Oh, I had no idea that’s why we were doing that.” If learners don’t appreciate the value of a task, they will not do it. Issue: The process or tasks actually bring little to no value. By exploring the reason for the original task/expectation, you may find that it isn’t even necessary. It’s important to ask, “What would happen if they didn’t do this?” If the impact is minimal, you may want to stop doing it. Sometimes employees aren’t completing a task you think is important because it actually adds no value. Issue: There’s a better way of doing it. Solution: Ask, listen and improve the process. When setting expectations, it’s critical to involve the end users. When you fail to hear their perspective, the process will inevitably be more difficult than it should be. When people know there’s a better way to do something, they will either complete it your way and be frustrated, complete it their own way and frustrate you, or not do it at all. Take the time to ask, listen and be open to improving processes. Issue: The tool or application is difficult to use. Solution: Fix the usability issue. You should never blame an employee or training program for a tool or application that is difficult to use. If improving the usability is not an option, acknowledge the issues and reset the expectations to be fair and realistic. Issue: The task is done infrequently. Solution: Make the process/application intuitive and easy to remember, or provide a job aid. Learners need repetitive practice to master a skill and retain information. If employees are expected to complete a process or use an application so infrequently that they can’t remember what they did last time, no amount of training will solve that problem. The solution instead is to develop applications and processes that are intuitive and have a high degree of memorability. If that’s not possible, it’s critical that you provide a job aid for the employees to use when the task is required. By taking the time to identify the true cause of performance issues, you will be able to support your organization’s efforts to create positive change, and your training program will develop a reputation for solving problems and improving employee performance. 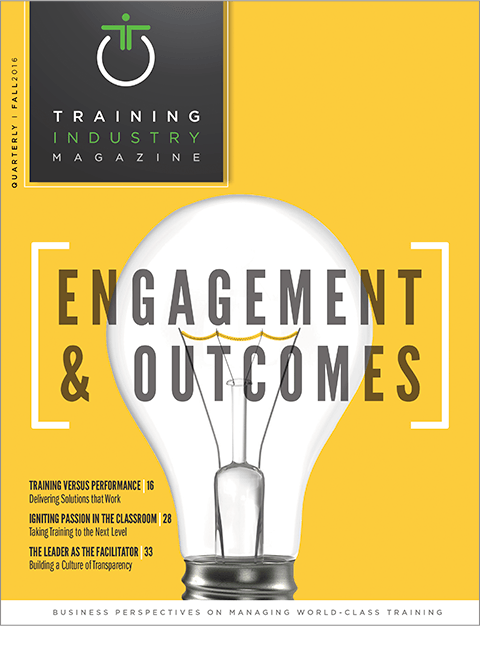 The next time you hear “I think our employees need some training on that topic,” have the courage to educate others about the difference between training issues and performance issues. Share your vision for identifying, developing and delivering solutions that work. Angela Wilson is a learning and development coordinator at Avista Utilities in Spokane, Washington. She has more than 15 years of experience delivering innovative learning solutions for organizations across a broad range of industries.